Israeli Prime Minister Benjamin Netanyahu has referred to the United Nations as the ‘theater of the absurd’. It is clear that he hasn’t seen the Mets front office recently. A week ago, the media criticism was endless as Fred Wilpon allegedly was ‘Irate’ that the Yankees got Giancarlo Stanton. The Mets owner seemed to forget that it is the job of fans to be irate and the owner to open his wallet. 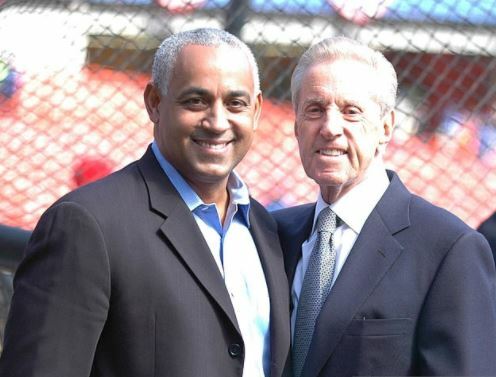 Wilpon responded by bringing back former general manager Omar Minaya in a jaw dropping move. When the Mets decided to end the reign of Terry Collins as manager, it was decided not to fire him. Rather, they gave him a front office position. At the time, some considered the move to strange but left it alone. However, the level of awkwardness is now off the charts. The Wilpon’s decided to bring back the former GM just days after giving his replacement an extension. Only the Mets could pull this off. Let’s assume for arguments sake that Alderson and Minaya will act 100% professionally, and work to build a better future for the Mets. One cannot ignore the fact that this is an odd couple. Sandy is from the data driven sabermetric school of the Oakland A’s. Minaya is from the school of scouting eyes. In the early Moneyball era of the mid 2000’s, Minaya was not adopting the new methodology. This isn’t inherently a bad thing. It is always good to have a variety of opinions in decision making so that better conclusions are made. However, the front office should address this difference in schools of thought. When Minaya came to the Mets, the franchise was a wreck. The 2000 NL pennant team felt like ages ago and they had just traded Kazmir in one of the worst moves in franchise history. Minaya convinced the front office to let him spend to improve the team. In his first season the Mets got Beltran and Pedro. The 2005 team had 12 more wins than the previous year. In 2006 the Mets went all in by getting Delgado, Wagner and Lo Duca. The team cruised to the playoffs but lost a game short of the World Series. The next two seasons were good but they each ended with a notorious collapse. That began a downward spiral that decimated the team. By 2008, the front office turned into a madhouse. The timing of the Randolph firing was ridiculous. The Tony Bernazard fiasco was painful to follow as well as Minaya’s personal attack on Adam Rubin. The big moves Minaya made from 2007 onwards just didn’t pan out. Castillo, Bay, and Putz were all busts. The handling of the Ryan Church concussion was borderline criminal negligence. The Oliver Perez contract was a case of Minaya outbidding himself for a bad pitcher. The K-Rod arrest only made things look worse. By the end of 2010, it became clear that the time had come to move on from Minaya. Minaya’s tenure as GM was a complex one. He clearly put together a great team on paper. The teams from 2005-2008 were strong but always seemed to underperform. While blame can be divided for this, it is generally considered to be the GM’s job to put a good team together on paper and for the manager to translate that into wins. On this basis, no one can honestly say that Minaya didn’t try. As time went on, many late round draft picks under Minaya went on to become big pieces of the 2015 and 2016 Mets. Murphy, Duda, deGrom, Goeddel, Niese, Gee and Nieuwenhuis are all examples. It is hard to tell if this was his keen eye for talent or just luck. This doesn’t include his high picks successes like Harvey and Matz. The general rule under Minaya was that his low picks tended to make more of an impact than his top picks. Go figure! The real question is not what Minaya did in the past. The Mets need to look to the future. While Omar was a real baseball insider years ago, it is not so clear if he still is. After leaving the Mets he spent some time in the MLB players union and as a VP in the Padre organization. Neither were positions of prestige. Not much has been written on the skills he acquired in both positions and how he has improved. In fact, the problem with this move is that the Wilpon’s haven’t been forthcoming with the fans as to why they think that Minaya will improve the team in his third stint. We can only hope that this move pans out and he turns into an asset for the Mets moving forward.